Blending scrapbook papers (or objects) is easy using Photoshop’s Layer Masks. Simply place the two scrapbook paper layers you want to work with on top of each other, then add a layer mask to either one. You can do this by going to Layer > Add Layer Mask > Reveal All OR by clicking the Add Layer Mask button at the bottom of the layers palette. This will add a second little preview of the layer on your layers palette (to the right of the usual layer preview). This will always show you the layer mask preview thumb in B/W only and gives you a good idea of what area you are masking while working with your scrapbook papers. Layer masks only work in black and white, so be sure to set your colors to that before you start your blend. Black hides things and white shows or reveals things. You can also use a black to transparent blend or shades of grey. The areas in the Layer Mask are only seen on the Layer Mask itself and won’t hurt your actual scrapbook paper image layer at all. You can select only certain areas and place a blend just inside the selection. You can knock out a background without actually deleting it so you can bring it back anytime and not double-up on layers or files. It’s a great, non-destructive editing technique for scrapbook papers or objects. Hate what you did? Just delete the layer mask and start over. You can usually right click or Control-Click on the layer mask thumb and choose “Delete Layer Mask” or just “Disable Layer Mask” from there. Re-enable it to turn it back on like a toggle. Once you have a layer mask attached to your scrapbook paper layer you can get started. Click the blank layer mask thumb on the palette, then use the Gradient Tool to draw a blend across the area you want to hide or show on your scrapbook paper or object. Do this in the document itself, not on the thumb preview or nothing will happen – except perhaps dragging the layer itself up and down the palette! 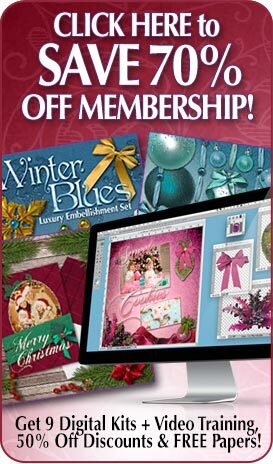 Once you get comfortable with layer masks, you can make complicated selections and try using different types of blends on your scrapbook papers or objects such as Radial, Angle, or Reflected, etc., by changing the gradient style up on the bar at the top of your program while you have the Gradient Tool selected. You can also just make selections and fill them in the mask, or even paint right into the mask instead. Brushes work there, too! Try to keep your masks linked with your scrapbook paper images so they don’t slide around and make things disappear. 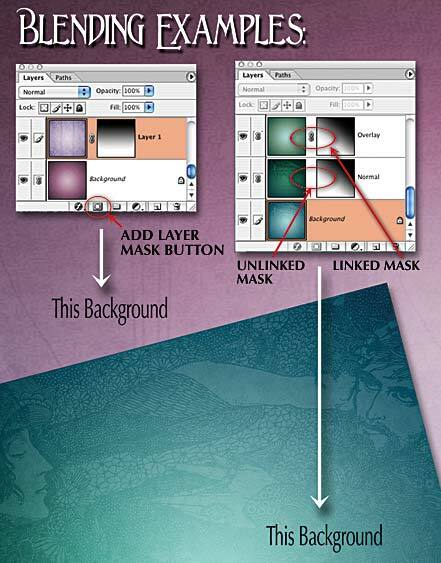 To do this, just click right between the thumb previews of the image and the mask on the layer palette. A little link symbol will appear, just like linking two layers together normally. When you first add a mask, it will usually be automatically linked, but it does happen that they come undone somehow and strange things start to happen! You CAN leave them unlinked if you want to and move the scrapbook paper or object image on the layer around, if that’s what you intend, which is sort of like cropping. It’s up to you and it can be toggled on and off just by clicking the little link symbol between the image and mask layer thumbs. If needed, collect your scrapbook paper layers into a group, duplicate the group and then merge the duplicate. You can find the Merge and Duplicate options by clicking the little black triangle at the upper right of the layers palette as well. Naming your scrapbook paper layers when doing this is a good habit to get into. You can safely turn off the original scrapbook paper group and return to it if needed. If the merged duplicate doesn’t look quite right after merging, revert back a step and try putting a clear empty layer BELOW the scrapbook paper or object layers you want to merge. Link it to your duplicated group and merge THAT grouping. That will usually keep your effects in place. For some reason the clear layer stops most layer style effects from becoming lost during the merge. It’s also better to apply drop shadows AFTER you are done merging, because once you merge a scrapbook paper or object group with a shadow… there’s no adjusting it! Don’t be afraid to experiment! You can always Undo, Revert to Saved, or use your History Palette to go back to a prior stage. Even better, work on a separate file if necessary, just in case. Try changing the blending mode of the upper layer to Overlay, Luminosity, or Multiply, etc. for even MORE variations of scrapbook papers!